Tamamura Honten started brewing Shiga Kogen Beer, like several other breweries such as Kiuchi Brewery, as an offshoot from a sake brewery. In 2004, Tamamura Honten applied for a license and started brewing in September of the same year. Unlike other breweries however, Shiga Kogen Beer receives 20% of its hops from the local area, produced by Tamamura Honten. Shiga Kogen House IPA – An 8% IPA brewed using 100% British malt. Shiga Kogen Indian Summer Saison – A 5% saison brewed in a traditional way. 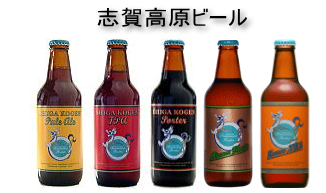 Shiga Kogen IPA – Shiga Kogen Beer’s flagship beer. Shiga Kogen Miyama Blonde – A 7% Belgian saison style beer. Shiga Kogen Pale Ale – Shiga Kogen Beer’s most popular beer. Shiga Kogen Porter – Simple porter that is most popular amongst Shiga Kogen Beer’s female drinkers. This will get updated throughout BeerTengoku’s life of Tamamura Honten’s seasonal and limited edition beers. Shiga Kogen 1t IPA – A 9.5% Double / Imperial IPA brewed with 1000kg+, or 1 metric ton, of malts. Shiga Kogen / Hair of The Dog Adamu – A 10% old world ale that is a collaborative release from Shiga Kogen x Hair of The Dog. Shiga Kogen Africa Pale Ale – An American pale ale that is supposed to be between a traditional English pale ale and an IPA. Shiga Kogen BLOND – A 5% seasonal blond ale that was first produced in 2015. Shiga Kogen Blue Bird Day Saison – A 5.5% saison with its name coming from winter sport days out where the snow is fluffy and white, while the sky is a clear blue colour with not a cloud in sight. Shiga Kogen Domestic Dry Stout – A 5% dry stout, also sometimes known as an Irish-style stout, brewed using locally sourced hops. Shiga Kogen DPA – Originally draft only, this 5.2% pale ale finds its way to bottles for limited times only. Shiga Kogen Drunk Coffee – A 5.5% pale ale that is part of a limited edition range which sees Trunk Coffee, based in Nagoya, throwing in some of their beans into the Shiga Kogen range of beers. Shiga Kogen Fake Weizen – A 5.5% witbier that is brewed using saison yeast first produced in 2015. Shiga Kogen Festival Saison – A 6% saison brewed using Bru-1 hops – an experimental hop from the USA. Shiga Kogen Harvest Summer Saison – A 5.5% saison style beer, slightly stronger than the traditional Belgian style and is released in autumn. Shiga Kogen IBA – A 7% Autumnal black IPA that is wet hopped using Centennial hops. Shiga Kogen IBrA – A 6% India Brown Ale brewed with eight different malts and oats, with some of them being domestically grown, and a variety of hops, to give it an IBU of 56. Shiga Kogen Imperial Indian Summer Saison – An 8.5% saison from Tamamura Honten that is part of their limited edition line up of beer. Shiga Kogen India Miyama Lager – A 6% India Pale Lager brewed using locally grown rice, the same strain that is used in the sake from Tamamura Honten. Shiga Kogen Kasumi – A 4.5% session IPA which uses 100% Golden Malt imported from the UK. Shiga Kogen Monkey Claws – A 12% barleywine named after the monkeys that habitat the Yamanouchi town, Nagano. Shiga Kogen New Engi-land IPA – A 6.5% American IPA based on the New England style first released in June 2017 to celebrate the opening of The Farmhouse. Shiga Kogen Nigai Lager Pilsner – A hoppy 5% pilsner brewed to make a bitter version of a popular style of beer. Shiga Kogen Not So Mild Ale -A 4.5% mild ale originally brewed with Nøgne Ø, a Norwegian brewery, for the Tokyo Beer Festival back in 2009. Shiga Kogen Not So Special – A 4.5% English bitter from Tamamura Honten that is part of their winter lineup of beer. Shiga Kogen No 10 Anniversary IPA – A 7.5% Imperial IPA brewed to celebrated 10 years of Shiga Kogen. First brewed in 2014 but on sale annually. Shiga Kogen Saison Blanc -A 5.5% saison brewed using two kinds of New Zealand hops and two different yeasts in the fermentation stage. Shiga Kogen Salty Hop – A 4.5% saison brewed using locally grown irises and peppers and also sea salt harvested from the Japan Sea to the north of Nagano. Shiga Kogen Shoubu Miyama Blonde – A 6.5% spiced / herb seasonal special from Tamamura Honten that contains the roots of sweet flags. Shiga Kogen Snow Monkey IPA – 5.5% American style IPA that is produced in limited quantities in both draught form and in bottles. Shiga Kogen Takashi Ichiro – An 11.5% imperial stout where they take a regular beer, in this case the Shiga Kogen Takashi Imperial Stout, and age it for eighteen months in Ichiro’s whiskey malt casks and then a year in the bottle. Shiga Kogen Takashi Imperial Stout – A 10% imperial stout which is aged for six months on-site and is named after the head clerk that used to work at Tamamura Honten. Shiga Kogen Two Rabbits IPA – A 9% imperial IPA where its name comes from the ancient Chinese proverb “A man who chases two rabbits catches none”. Shiga Kogen Wheat Ale – A 5% Summer seasonal brewed to a German hefeweizen recipe and infused with American hops. Shiga Kogen WIBA Masaji The Great – A 9% black IPA from Tamamura Honten and is part of the Masaji Beer Project series. Shiga Kogen Yuru Buru Wheat – A 5% wheat ale and is part of their limited edition range and was first released in May 2017 as part of a 10th anniversary celebration to the Yuru Buru blog. Tamamura Honten The Far East Barrel Aged House Imperial IPA – Take the Shiga Kogen House IPA and age it in Ichiro’s malt whisky barrels. Tamamura Honten Yamabushi Apricot Saison – A limited edition 6% saison from Tamamura Honten that is part of their Yamabushi range of beers. Tamamura Honten Yamabushi Grand Rouge – a 6% fruit beer based on a saison, though this one has had blueberries and raspberries infused during the secondary fermentation stage. Tamamura Honten Yamabushi Hops & Brett – a 6% saison brewed in 2015 and then aged for a year with Brettanomyces and then dry hopped twice with American hops. Tamamura Honten Yamabushi Saison Brett – a 6% saison, taking a saison base and infusing it with different adjuncts, in this case Brettanomyces. Tamamura Honten Yamabushi Saison Noir – a 9% black saison. Tamamura Honten Yamabushi Saison One – a 6.5% saison brewed using locally-sourced hops and also sake rice. Can you visit the brewery? Yes, if you email then they will sort something out. There are also two places to drink on site – Tamamura Honten Gallery and also Teppa Room. Thet are one of the top 3 craft beer brewers in Japan in my opinion. Their regulars are consistently good, and their seasonals / specials are always worth looking out for. Agreed – yet to have a bad batch of beer from them.